Posted by WorldbyStorm in Economy, European Politics, Irish Politics, US Politics. Those of us who might have felt a degree of scepticism when presented with the contention by Joanne Richardson, CE of the American Chamber of Commerce Ireland (by the way, is that actually American, or US? It makes a difference) that ‘Ireland is not – and has never been – a tax haven’, and whose scepticism was generated by the sense that this was a semantic distinction resting on a definition that included imposition of a single tax rate but variability in terms of what is actually taxed, will hardly have been dissuaded from that stance by the news today that another US based corporation, Boston Scientific paid an effective tax rate of 4% in 2011. Boston Scientific’s accounts for its main Irish subsidiary note that if corporation tax of 12.5 per cent was levied, it would pay $177 million in Irish tax. However, the actual tax the group was legally obliged to pay was lower for a number of reasons, including “different tax rates on overseas earnings”, according to the accounts. And it’s not the only one. Not by a long shot. Novell, Symantec and Microsoft, amongst others were able to avail of such arrangements. In many cases the multinationals also have substantial operations here under the control of fellow Irish subsidiaries, the profits of which are subject to Irish tax, with the links between the two forming part of an increasingly popular global tax structure called the “double Irish”. The net effect of the structure is that multinationals can route tax-free profits through Ireland to offshore havens paying only a small amount of tax here. Ireland’s 12.5 per cent tax rate, while low, is not subject to any arbitrary adjustments and it applies equally to all corporations with a taxable presence in the jurisdiction. Not many countries can say the same. They are: having no taxes or only nominal taxes; a lack of transparency; an unwillingness to exchange information with tax administrations of OECD member countries; and the absence of a substantial activity requirement. None of these criteria applies to Ireland. Furthermore, in December 2012, Ireland became one of the first countries in the world to sign an agreement with the United States to improve international tax compliance and implement Fatca (Foreign Account Tax Compliance Act). This type of agreement is now being hailed as the emerging international standard for the automatic exchange of tax information. …while, oddly enough, not engaging with the ‘double Irish’ or the possibility of variability in application in the slightest. That’s quite some omission given the nature of the current debate. Minister of State for European Affairs Lucinda Creighton travelled to Washington yesterday to rebut the assertion that Ireland was a tax haven for US multinationals. The Minister said that Ireland had a statutory corporate tax rate that was “not negotiable” and that the Irish authorities “don’t cut special deals for any company”. There’s a certain sense of a scrabbling for purchase on the decks as this particular ship tips over in the water. It’s not that I think that matters will change radically in one way or another, but the current mood music in relation to matters tax internationally is one that does not favour this jurisdiction’s approach across the last two or three decades. In a way this is a perfect inversion of the Irish exceptionalism argument, that somehow Ireland by dint of its small open economy is unable to implement measures that otherwise are normative in economic matters (though notably it’s only the more – shall we say – progressive measures where problems arise). There ain’t no such thing as exceptionalism in a global economy, particularly when one has friends like Apple who are willing to spill the beans – from their position of pure self-interest – something that should have been factored in from the start, and which only the most naive would ignore. If the broader climate shifts against these sort of tax regimes (to put it at its kindest) well then, so be it, all bets are off and everyone is trying to claw back what they can. …we should not shy away from robustly protecting our competitive tax regime. We can stand firm in the knowledge that our tax regime is internationally recognised as fair and just. When Ms. Creighton goes to Washington then it might just, could just, possibly be that the reality is anything but that ‘our tax regime [being] internationally recognised as fair and just’. I raised the point in the last week or two that much of the damage comes not just from our neighbours in Europe (though they will be seething), or the US (and likewise) but from those companies which were not the beneficiaries of such largesse. And that very point is echoed in the assessment here from earlier in the week in the IT. In politics this sort of thing is sometimes referred to as constructive ambiguity. No one is shown to be lying; everybody is confused and hopefully loses interest. The US and Irish public will probably lose interest. The same can’t be said for the OECD, France, Germany and those chief executives paying 12.5 per cent. Many thanks to No2CrokePark2 for forwarding this. Thank you for your mail and for outlining your views regarding ongoing issues on public sector pay and conditions. Our approach was, and always is, to seek agreement. That is why we supported the LRC process and their proposals. I have no wish to have confrontation – especially not with public sector workers who have already suffered pay reductions and seen their living standards fall. However, the public service pay and pensions bill at 36% of spending must, in the Government’s view, make a proportionate contribution to the additional expenditure reduction identified as necessary over the three-year period. As you may know, my own work in the Department of Health is deeply challenging and pay cost reductions of 150 million have already been included in this year’s health budget. I recognise that all public servants have already made a significant contribution to our economic recovery. However, measures in this Bill will be necessary to achieve sustainable public payroll costs that enable us to meet our fiscal responsibilities. The approach of our Government today to secure further savings from the public service pay and pensions bill is markedly different from the approach employed by the previous Government in 2009. While I appreciate your support, I want to assure of one thing, that I and my colleagues in the Parliamentary Labour Party are cognisant of the huge pressures being faced by so many people, including public sector workers. The challenge is to try to address and solve the problems we face. Thank you for taking the time to write to me. Alex White TD, Labour Party Dublin South. I appreciate that you have taken the time to reply but I must point out a number of issues to you. 1. You are interfering with the democratic process within the Trade Union Movement by threatening workers with a worse situation if they don’t agree to your proposals as accepted by the Trade Union “leadership”. This interference is intimidation by a Government [how gross can you get] of its citizens and, clearly, it is anti-democratic. As a democrat, this is totally unacceptable to me as it should be for you. 2. In my opinion, Progressive Taxation is the fairest answer to the budgetary position. Using Fair Progressive Taxation, you can get the required funds to run our public services effectively. This is not a selfish act on my part. In a Fair Progressive Tax System, I am not expecting to gain anything but I fail to understand why you think I am earning too much and need to contribute more to solving the country’s fiscal difficulties while someone in the private sector who earns more (sometimes much much more) doesn’t need to contribute any extra. You keep telling me this is FAIR – It must be my North of Ireland education that makes me not fully grasp the notion that it’s perfectly fair to pick out a minority of workers and treat them adversely differently to others (you were definitely planning to do that earlier to all public servants but now you are threatening to do it again to a minority of the minority – no half measures with this Government). I should understand that this is normal practice for Governments – I grew up with it in the North. Maybe 35 years living in Dublin has changed me. 3. It is clear that the people who are proposing and supporting this legislation have never suffered financial pain. They don’t understand the value of €20 to someone who can barely feed their children, in many cases because of loans that generated huge profits for certain untouchable individuals. Many of these loans are now unsustainable, not because of negative equity, but because of falling incomes and rising interest rates brought about by the last Government and continuing with yours. Remember we own the banks. Assert authority. Stop pretending you can do nothing about their wages and bonuses when you can rush through draconian legislation like this. You now want to inflict more pain on the needy and more again if they dare to say no to your planned cuts because they can’t afford them. Find a better way. That’s what you were elected to do. People didn’t vote for you or your partners in Government to give us more of the same and worse. There simply has to be a better way. Find it. Find a way to catch the untouchables that got rich out of this debacle and leave ordinary citizens alone. That’s what you get paid to do. Don’t forget its tax payers’ money that keeps you in a job as well as me. I do mine to the best of my ability. Can you say the same or does some sort of party loyalty take precedence. We’ve had enough of this warped ideology that says you can’t touch the wealth or profits of wealthy corporations and individuals. I’m prepared to pay more through a Fair Progressive Tax System. I am sure many individuals and corporations with more than me and earning more than me are equally willing to pay more. Why won’t you ask them? Apart from the inappropriateness of Shatter’s use of confidential information from the Garda Commissioner, he has to deal with the claim he behaved improperly in not completing a random breathalyser test in 2008 or 2009. Mark the day: Stephen Collins has called the behaviour of an FG minister “inappropriate”. Mirabile dictu! Must be some bigger fish needing slipping the net. Ah, the cynicism of our citizens. No doubt a source of deep concern in governing circles. And yet, it is an interesting point that Collin’s has had to acknowledge the problem. it’s perhaps worth – in the aftermath of the extremely predictable vote of confidence in the Dáil – surveying a few of the comment pieces over the Shatter affair. Useful reading they make too, in relation to the lorry loads of rhetoric from Enda Kenny about a ‘great reforming Minister’ offered to us in the last forty-eight hours. …his behaviour over the Mick Wallace affair has been disgraceful. It has diminished Shatter’s authority, damaged his credibility and demeaned his office. He obtained and cynically used confidential Garda information to damage a political opponent in debate. But it is what appears to us to be a clear abuse of his power. There is no ministry in which the proclivity to abuse such power is more serious than the one Shatter holds. In any other country – or at least in any country to whose standards of governance we aspire – he would have been forced to resign by now. Indeed, by the standards Shatter explicitly espoused in opposition, he would have resigned. He rightly demanded Willie O’Dea’s resignation because O’Dea had, in his words, “publicly discussed, for his own electoral gain, confidential information furnished to him by a member of An Garda Síochána” about a political opponent. Minister Shatter’s behaviour has not just been unwise, it has been utterly unacceptable. For his own sake and that of his office, he should resign. Mr Shatter was inappropriately briefed by gardaí and then inappropriately used what was, yes, private information. It’s no more complex than that. The willingness of Taoiseach Enda Kenny to spring uncritically, “100 per cent” to Mr Shatter’s defence is deeply disappointing. This was not a minor spat on TV, but profoundly important questions being raised about the political abuse of the Garda with their connivance. Not a matter to be brushed aside. Mr Kenny insisted that the Minister was not “collecting files on any individual or any member of the House or anybody else”. And just as well. But no one claimed Mr Shatter was creating files. Both Mr Shatter’s actions and his dismissive response to criticism will certainly alarm the party’s cowed backbenchers. Time to call a halt to an arrogant Minister’s contempt for democratic norms. The kindest interpretation of Mr Shatter’s fireside chats is that they were at best gauche. Others are casting them in a more sinister hue, for the politicisation of the gardai, particularly if consensual, is an egregious breach of the appropriate balance of powers in any functioning democracy. The “Caesar’s wife” principle means garda commissioners should exercise great care if they don’t wish to be exposed to the alternative “wives of Henry VIII” principle. Last week, Mr Shatter grandiosely claimed his woes were caused by an “inconvenient habit of telling the truth about issues”. In the case of Mr Shatter, the main source of his troubles, however, is that we are finding out the truth about him. Thankfully, his erratic public persona has also unveiled unnerving truths about a spirit that appears to have seized certain elements of this Government. Ironically, given its embrace of a “democratic revolution”, one of the signature tunes of Fine Gael, in particular, consists of a chilly hysteria when it is exposed to the mildest criticism. As for Mr Shatter, given that he is such a slow learner, our expectations about his capacity to stay out of trouble are low. Two simple points will suffice. Firstly, Mr Shatter in opposition would always fully and robustly pursue an issue like this. In fact, the Justice Minister is rather lucky nobody has chosen to emulate his line in past rhetoric here. Secondly, this all arises from Mr Shatter’s own words, in a definite unforced error. Mr Shatter was well ahead in a television debate about the quashing of driver penalty points. But he could not resist gratuitously throwing out a piece of confidential information about his debating opponent. dded to that are three important unanswered questions which arise from Mr Shatter’s own admission that he was stopped by gardai in late 2008 or early 2009. We need to know more about how and why he failed to give a sample of breath to the garda who stopped him. We also need to know whether he was courteous to the garda in question. And we need to know if he was invoking ‘parliamentary privilege’ when he told the garda he was travelling home from the national parliament. Former British Labour government media adviser, Alastair Campbell, has said that any minister about whom controversy continues for more than 10 days is unlikely to survive. By that yardstick, Mr Shatter would be on the Dail backbenches early next week. He’s still there though. Damaged? Surely, but given the numbers what likelihood that he need start worrying about his position? Little or none. Previous Ministers have had opportunities to introduce these reforms but few have bothered. The reason the Minister, Deputy Shatter, bothers is not because of his widely recognised expertise in family law.He bothers because he cares about the individuals who must navigate the system, how they are treated and how the State delivers for them. There is no better example of his caring attitude towards people who were previously ignored by the State than the citizenship ceremonies he has initiated. While they may appear like a small thing, if the Deputies opposite ever visit one of these ceremonies, they will recognise that they are not a small thing for those participating and in attendance. There’s far too much of this thinking around these days in Irish politics as a whole, a sort of ‘if intentions are good then all is beyond question’. Just six foreign executives have availed of [the] government tax break. Now what does that suggest? Perhaps that far too much is made of such schemes, that corporations, and I’ve seen this at first hand (even if we weren’t given an object lesson in same from Apple in the last week or so), have ways of circumventing taxation in all forms, or mitigating its impact on the individual. Under the scheme, expenses paid to employees for private school fees of up to €5,000, as well as travel and trips home, are also exempt from taxable income. The department data showed that just one employee availed of the education relief. Why should the state be enabling lifestyle choices like private schooling? Particularly when it pours enormous sums of money into the public education system? It’s like a perfect vote of no-confidence in that area of state provision, or an attitude that those who are wealthy, and those are people on fabulous incomes from the get go, will ‘of course’ choose private schooling and must be facilitated in that choice. There’s something uniquely dispiriting about that. Entertaining line from FF which isn’t agin such schemes, but wants better promotion. Really? To see yet more income evade the state? Though can’t entirely disagree with the idea from the FF spokesperson that ‘the government would get a greater return from helping the domestic small-to-medium-sized enterprise sector’. Posted by irishelectionliterature in CLR Political Quiz. 1. What was the name of the ‘Steamy’ Novel written by Alan Shatter? 2. In 2002 what party had the slogan ‘Ambitious for Ireland’ ? 3. 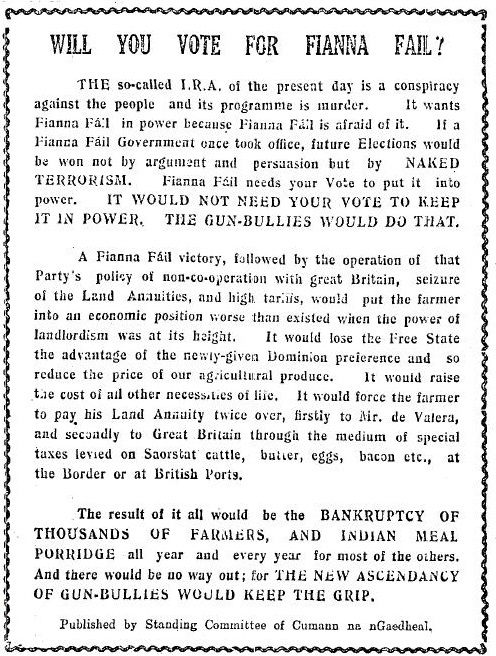 In June 1927 Clann Eireann fielded 7 candidates in the General Election. They were a split from which party? 4. Richard Kennedy and Derek Deane were the losing candidate in which 2010 Election? 5. William Buchanan, Winston Patterson and Jim Devenney were all elected to Donegal County Council for which Party? 6. For which party was former Louth Labour TD Michael Bell, first elected to Louth County Council ? 7. Which Referendum featured a group ‘Sportstars for Yes’ ? 8. Which of these have not been members of the Oireachtas, Seamus Mallon, John Cushnahan or Austin Currie ? 9. Which Fine Gael Senator won a Silver Medal at the 1978 European Athletics Championships? Posted by irishelectionliterature in Irish Election Literature Blog. Then from 1969 ‘Your Rights. Corporal Punishment In National Schools’ From A Labour Party Magazine ‘Action’. From the 1996 Bail Referendum, a leaflet from ‘The Right to Bail Campaign’ urging a No vote. A number of ads for events to do with Eoin O’Duffys National Corporate Party. The Revenue Commissioners last night confirmed that owners of more than 1.53 million homes filed property tax returns before the deadline of 8pm. Returns have been filed in respect of 1,539,822 properties, and when about 160,000 properties – for which local authorities or housing associations have responsibility – are included, the figure rises to close to 1.7 million. At 5.30pm, with less than seven hours to go before the original midnight deadline, 1.45 million property owners had completed their self-assessment. This pointed to a registration rate in excess of 87 per cent of the 1.66 million notifications the Revenue sent out in March and indicates the tax authority has already met its own targets. I can’t quite square the figure of 1.7 million quoted in the first and the mention of 1.66 million notifications sent out. Are they the same number and where do LA and HA numbers fit in with them? But anyhow, what do people think of the figures now emanating from Revenue as regards payment levels. Is there any road at all left for the campaign? If so where does it go from here? If not, what happens next? Posted by guestposter in The Left. Following the announcement of the siting of the G8 summit in Fermanagh, a range of civil society organisations formed a working committee designed to co-ordinate events offering an alternative and a challenge to the agenda at the G8. A statement of principle is below. Events during the Fairer World Festival include debates, lectures, film screenings, comedy, music and dance, featuring Tariq Ali, George Galloway, Scott Capuro, and dozens of local and international artists, activists and thinkers. Programmes and leaflets can be collected from the ICTU’s Belfast office, 4-6 Donegall Street Place Belfast. The committee, hosted by the Northern Ireland Committee of the Irish Congress of Trade Unions, comprises trade unions, trades councils, and campaigning groups such as Amnesty International, Friends of the Earth, the IPSC and anti-fracking campaigners. The committee supports and works with the IF campaign. Civil society organisations have come together to offer people an opportunity to challenge the policies and priorities of the G8 leaders who meet in Northern Ireland in June 2013. Our organisations represent many different interests but we are united in a commitment to the creation of a world that is fair and just for all. We believe that achieving social, economic and environmental justice must be central to political decision-making. We will coordinate a festival of events to coincide with the G8 summit, including a major public demonstration in Belfast, calling for a fairer world. There will be a major public march and rally held in Belfast on Saturday 15th June 2013. The event is being timed so that people can participate in the march and go onto other events being planned in Belfast on that day, such as the IF Campaign’s major event as well as other talks, debates, concerts, screenings and exhibitions – part of the Fairer World Festival. Posted by guestposter in Irish Politics. On 9 May 2013, the Irish Supreme Court rules that collective bargaining is unconstitutional. On 24 May 2013, the Irish government introduces a Bill to punish those who don’t enter collective bargaining. Posted by WorldbyStorm in British Politics, Economy, European Politics, The Left. Reading a piece in the Guardian by Alan Sked, a founder of UKIP who left them in 1997when ‘it became a magnet for bigots’ I was entertained to read the following. Sked is of the opinion that ‘We need a Eurosceptic party of the centre left’ in Britain. And he argues that the current crisis of the European Union and the broader ‘grand projet’ as he sees it has demonstrated it as unfit for purpose due to its reliance on ‘progressivism’ which, in his view, sees it as of a kind with Marxism. Built on progressive myths (“It has brought peace to Europe”; “it extends democracy”; “it creates prosperity”), it is now in relative economic, demographic and technological decline, lacks accountable or transparent structures of government, and is damning future generations to unemployment and despair. It is run by a self-serving, bureaucratic and political elite, is notoriously corrupt, and is admired only by politicians from the Middle East or Africa who bewail their own lack of unity, or by Americans who see its member nations as the colonies of 1776. Its policies are undemocratic – it has forced unelected, technocratic governments on both Italy and Greece – and do not work. Its single currency has brought penury to half a continent. Its present existential crisis has brought political chaos to Italy, Greece and Spain and threatens the same in France. And I suspect that after the last five or so years there will be many who will find that critique more than half-correct – even if some will demur at the conclusion that the only way is out (for the UK at least, though such voices are more in evidence here than they once were, albeit mostly it is an issue of leaving the eurozone rather than the EU). whose vision of the future is the 1950s – a supposed golden age before the EEC, black people, Muslims and other immigrants, gays, lesbians and other products of the sexual revolution of the 1960s, desecrated this island Eden. Sounds about right. For some reason Fargage always reminds me of Alan Partridge, but that is in a way to underestimate certain strands of reaction that are extant in the British polity. Anyhow, for Sked the question is why there is no ‘centre left’ Eurosceptic response akin to UKIP. I think this is a misunderstanding of how Europe played out as an issue in the British Labour Party since the 1960s. In a way the antipathy towards it seems to have dissolved in part precisely due to the way it became more and more of a token of Thatcherism, and beyond Thatcher even further to to the right. Which is not to say that eurosceptic tendencies aren’t extant in the BLP – but those were often submerged by a broader caution – as evidenced in the way in which Gordon Brown effectively ruled out joining the euro in the lifetime of the Blair-led governments. There was also an element of substitutionism, particularly over, but not restricted to, the social chapter, where it was felt that in some ways the EU was expressing a part of the social democratic project. There was a time when Labour was adamantly anti-EU. Gaitskell, Foot, Kinnock and even Blair opposed it. But then Jacques Delors told the TUC that whereas they were impotent to defeat Thatcherism, he could and would overthrow it from Brussels. Almost overnight, Labour’s patriotism disappeared and the party stood on its head. Brussels had managed to divide and rule Britain. It’s odd though, because Sked’s passion for the topic is perhaps not served well by the altogether lack of dispassion displayed in his analysis. It’s not so much that his criticisms are without any foundation at all, but perhaps a cooler assessment might strengthen them. The Welsh windbag, Kinnock, even became an EU commissioner and made a tax-free fortune doing nothing for the public interest but sacking whistleblowers in the corrupt EU bureaucracy. His must be the most pathetic career in postwar British politics. Blair and Mandelson, of course followed suit (although Blair failed to get an EU presidency) and – amazingly – this whole discredited clique still advocates that Britain join the euro. 3. A social policy which seeks to provide decent pensions, care, social housing, welfare benefits and full employment to all in need after a sound education that caters to everyone’s talents (including those with disabilities). 5. Domestically, the most radical changes, apart from ending an austerity aimed mainly at the poor, might be constitutional. It might be wise to federalise the UK and make the House of Lords an elected federal chamber. Perhaps an independent Britain could negotiate a confederation of the British Isles with the Irish Republic to help solve Ireland’s problems. Still COBI is an idea which has floated around in various forms and in the context of various organisations for a long time, arguably since the outbreak of the conflict in the late 1960s. Some will think of the Socialist Party’s approach, but I think, in fairness to them, they come from a somewhat different starting point. Funnily enough the idea is raised – and subsequently dismissed – in this document here in the Left Archive, from the British Labour Party in the 1980s. And in a slightly different context it was floated in the early 1980s by some in an attenuated form as the Islands of the North Atlantic.., allowing for the cute acronym IONA. The closest we’ve seen is probably the British-Irish Council which I had forgotten has its own ‘standing secretariat’ in Edinburgh which was established last year, and is probably close enough to the IONA concept. On a slightly different tangent some interpret Alex Salmond’s push to devolution max for Scotland as tipping towards a de facto Confederation of the British Isle’s albeit – obviously – without the Republic. As to the likelihood of any such Confederation? Hard to believe that it would ever manifest itself in those terms, vastly more likely that links will accrue piecemeal between the various sovereign states and devolved entities on these islands as time progresses.